My past experience with RainX on my car windshield was somewhat good. The product delivered its promised – water bead and roll off the windshield even while traveling at speeds around 50kmh. Even without using the car wipers, visibility in rain was significantly improved. I eventually stopped using it as it caused my wiper to jitter and then I got lazy with the reapplication. With its superb water beading efficiency, I’ve always wanted to apply it onto my motorcycle helmet visor. It would have been awesome if it worked as well on the helmet visor in the rain. However, I’ve always knew that the original RainX was not compatible with plastics. It even says so on the label. And so I gave up on that idea. 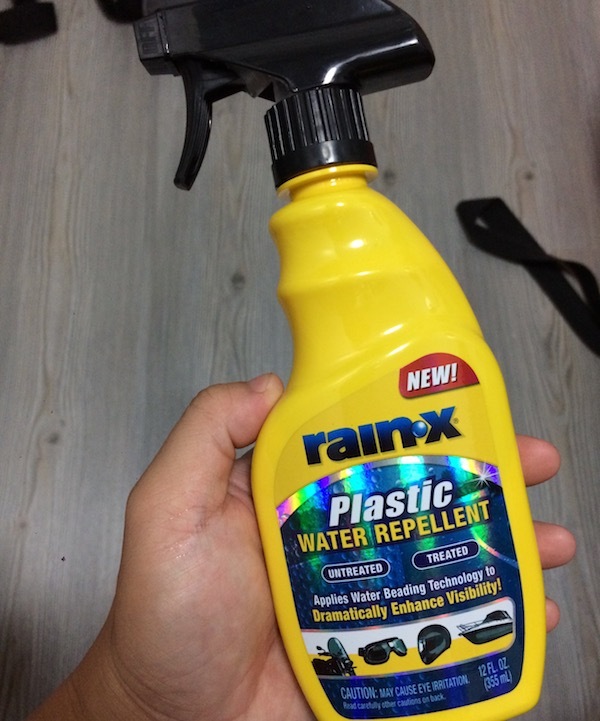 The bottle of Rain-X Plastic Water Repellent. Wow! Perfect for the really, really, wet weather of this region! And so I applied it onto my motorcycle windshield and helmet visor to test the wonder product. Well, let me explain. Application was easy enough – spray it on, wipe it around, and then wipe it off with a clean cloth. Although it took a wee bit more effort to buff it off to optical invisibility as compared to my current favourite product – Meguiar’s Ultimate Quik Wax, it was still easy enough to buff it off. Yes, I know, Meguiar’s UQW was designed for application on painted surfaces, but I found that it works excellent on plastics too – including on transparent plastics! Plus, it smells so much better than RainX’s Plastic Water Repellent – perfect for application on the motorcycle helmet and visor! Okay, before I digress further, let me get back to RainX. While I’m pretty certain that it DOES bead water, I found that it didn’t live up to the previous experience I had when I used the RainX Original on my car’s windscreen where I literally witnessed water rolling off from the windscreen when traveling at highway speeds. During rain, water did bead on my helmet visor, but it didn’t roll away as effortlessly as I expected it to. And I noticed the same on my motorcycle windscreen too. In fact, I recall that water would bead and roll off slightly BETTER when I had Meguiar’s UQW on the helmet visor instead! sgBikerBoy’s preferred water beading product – Meguiar’s Ultimate Quik Wax. The nice sweet candy smell of the product is an added bonus too! So, does this product work? Probably. Would I recommend it? Nah. Would I buy it again? Nope! 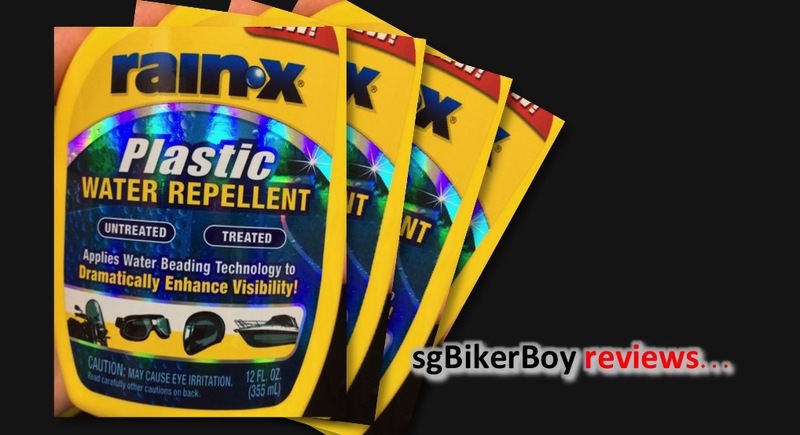 The RainX Plastic Water Repellent gets a THUMBS DOWN from sgBikerBoy. I have the same experience as you. For the same product it seems that it works better on glass than on plastics. Possibly due to the different surface tension of the two materials. Great review. Keep it up, looking forward for more. Yup – disappointing product from an otherwise reputable company. Actually, the Rain-X Original and the Rain-X Plastic are 2 different products. Bro, I hope u are charging them for advertisment fees. I just bought a bottle of UQW base on ur vivid description. Haha. Nope. I do not collect any advertising revenue from this site. Yet. 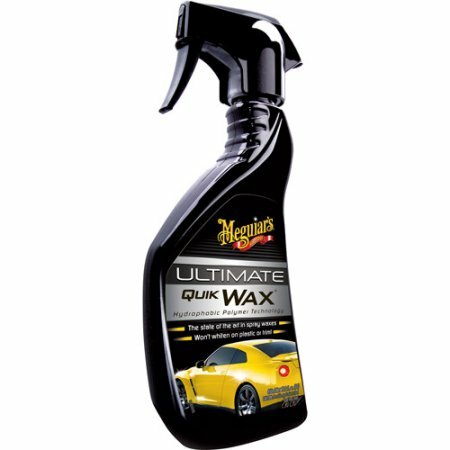 Nevertheless, I’m certain you’ll love Meguiar’s UQW. I’ve been using it for years – previously on my cars and now on my bike. I just finished a bottle – and didn’t rush out to buy another yet. Not because I no longer like it, but I’m now reviewing another product. Also gives me the impetus to finish my bottle of RainX quicker. Previous Previous post: Why do motorcycle front and rear tires have opposite tread patterns?